Ethnic vegetables/fruits are not readily available where we live, but veggies like plantain are making their way to regular grocery stores now days. I love to buy them and stock them up in my pantry to ripe. Once they are ripe, I steam them for breakfast or pan fry them with some Coconut Palm sugar and a bit of butter. Since my kids love them, I have a tendency to buy them often and keep them in brown bag to ripe. 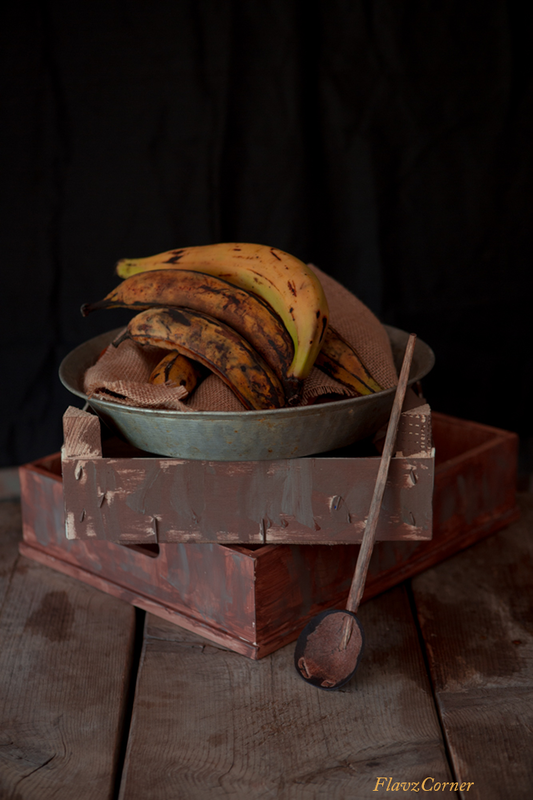 As a normal Mom, I have my share of forgetting things and it sometimes results with a bag of over ripe plantains. When you have a bunch of plantain sitting in the kitchen counter with dark skin, it doesn't seem to be appealing to the kids or even to me. My conscience is always hesitant to waste food, so I had to use my noodle to come up with some recipe that could use up the over ripe plantains. Hence this easy minimal ingredients recipe originated. My hubby gave thumbs up and I had made it few times since my first trial. 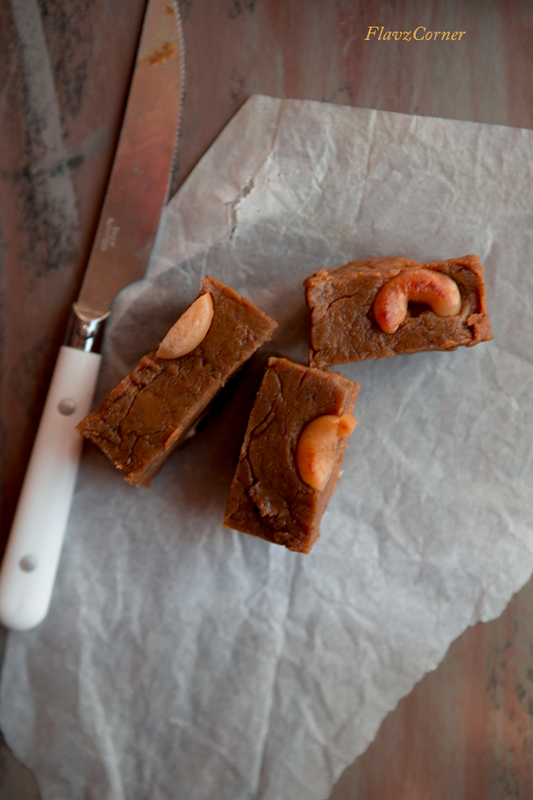 I think it’s about time to share this quick and easy recipe for Plantain Fudge / Ethakka Halwa. Hope you will try it soon! They are a reliable source of starch and energy. They contain adequate amount of dietary fiber. Fresh plantains have more vitamin C and Vitamin A than regular bananas. Vitamin A plays a vital role in the visual cycle, maintaining healthy mucus membranes, and enhancing skin complexion. They are rich sources of B-complex vitamins, especially vitamin – B6, which is a vitamin used for treating neuritis, anemia and coronary artery disease. They also provide adequate levels of minerals such as iron, magnesium, and phosphorous. Fresh Plantains contain more Potassium than regular bananas which helps to control heart rate, blood pressure and countering negative effects of sodium. Steam the plantain in a steamer for 15 - 20 minutes till the plantain gets nice yellow color. Keep it aside to cool. While plantain is steaming take a non stick pan and dry roast the wheat flour for 5-6 minutes on low to medium heat till a nutty aroma comes. Turn off the flame and let the wheat flour cool down. Meantime melt the jaggery in 1/2 cup of water in a sauce pan over medium heat. Strain to remove any impurities and keep the syrup aside. Remove the skin of the steamed plantain and mash it with a spoon or a potato masher. Heat a non stick pan with 1 tbsp of ghee. Fry the cashews till light golden brown. Using a spoon remove the cashews into a bowl. Add the mashed plantain into the pan. Keep stirring for 5 minutes till it gets light brown on the sides. Lower the flame to the minimum, add the jaggery syrup and wheat flour. Its time to do some serious stirring to make sure that no lumps of wheat flour is formed and everything is mixed together. Add 2 tbsp. of ghee and stir continuously till the mix is sticky and gets brown color. This will take somewhere between 10-15 minutes. Add the cardamom powder and half of the fried cashew nuts, mix well and turn off the flame. Transfer the Halwa to a square or rectangle container greased with ghee/butter. Level to top using a spoon. Arrange the left over cashews on the top of the Halwa and push it down to stick. Leave it outside to cool. Cover with a plastic wrap and refrigerate for 2 - 4 hours. Slice them into pieces and enjoy. 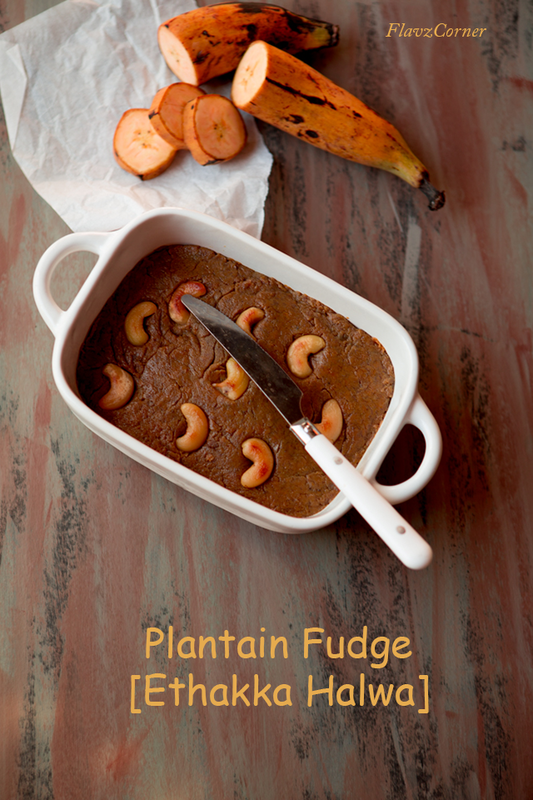 wow..this looks interesting n yummy fudge...my family loves plantains too so can try it out soon dear,Thanks for sharing! They are so fudgy and delicious! So in need of a sugar fix with this halwa. Looks delicious!